Hey there! That guy in the picture, that's me: My name is Christoph, and I'm assistant professor of business informatics at the Johannes Kepler University Linz. You may now ask: Where's Linz? And what's business informatics anyway? Well, the first one's easy: Linz is a city by the Danube in Upper Austria. The second one takes a little bit more time to explain but you may think of business informatics as a kind of applied computer science with a hint of social sciences. Personally, I'm more on the computer-science side of the discipline. You know, building systems and technical stuff, mainly in the areas of business intelligence and data science, but also business process modeling and management. Still, I'm also doing research on the social and organizational aspects of computing: investigating people's attitudes towards security and privacy as well as looking at the pracitical and theoretical lessons that can be learned from business intelligence projects. During my time at the Department of Business Informatics – Data & Knowledge Engineering – that's my group at university, which I'm currently deputy head of – I've been involved in multiple collaborative research projects together with various industry partners, such as Frequentis AG, solvistas GmbH, or smartbow GmbH. Some of my master's students have been working for such companies as ENGEL AUSTRIA GmbH as part of their thesis work. I've also had (and still have) research collaborations with the Fondazione Bruno Kessler, the University of Massachusetts Boston, the University of Konstanz, and Portland State University. Should you be interested in a research collaboration, whether as an industry or academic partner, please don't hesitate to contact me. If you are a student and interested in a master's thesis, possibly together with a company, you're also more than welcome to just send me an e-mail. Thesis: Multilevel Business Processes - Modeling and Data Analysis, Springer Vieweg 2015. This thesis won the TDWI Award 2011 for Diploma and Master's Thesis awarded by The Data Warehousing Institute (TDWI) Europe as the best thesis in Germany, Austria, and Switzerland on business intelligence. Internships at Oracle Austria and SAP Research CEC Karlsruhe. Funding by Austrian Federal Ministry of Transport, Innovation and Technology (BMVIT) in program "Production of the Future"
It's probably best if you just have a look at my dblp or Google Scholar profile. My dblp profile doesn't list my contributions published at aeronautical conferences. Course on Data Engineering in the MBA program on Applied Knowledge Management at JKU Linz. Over the years, I've given a number of presentations and invited talks (apart from the usual paper presentations at conferences), which are listed here. Presentation at the College of Management of the University of Massachusetts Boston on 24 August 2016 in Boston, Massachusetts, USA. Presentation at the School of Information Technology & Mathematical Sciences of the University of South Australia on 2 October 2015 in Adelaide, Australia. 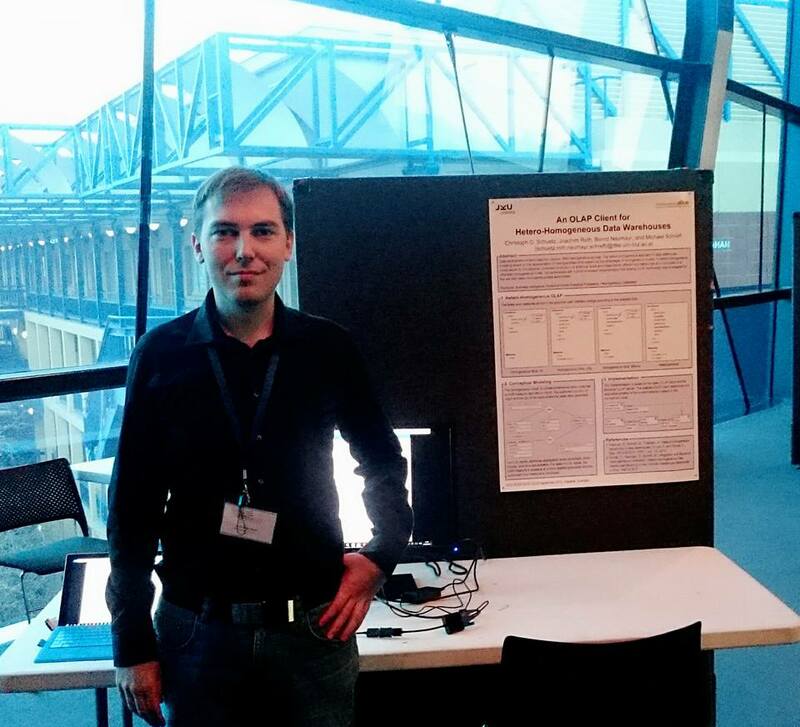 Presentation at the Global Information Systems Group of the ETH Zürich, 4 April 2014 in Zurich, Switzerland. Presentation at the Department of Data & Knowledge Management (DKM) of the Fondazione Bruno Kessler, 17 December 2013 in Trento, Italy. Presentation at the Department of Computer and Information Science of the University of Konstanz on 15 July 2013 in Konstanz, Germany. Poster presentation at the Third European Business Intelligence Summer School (eBISS 2013), 8-9 July 2013 at Schloss Dagstuhl, Germany. Presentation of the diploma thesis on occasion of the award ceremony of the TDWI Award 2011 at the Eleventh European TDWI Conference with BARC@TDWI track, 7 June 2011 in Munich, Germany.